The new Hulk isn’t incredible, but it shows some modest improvement. Welcome to Hollywood in the 21st century, a time and place where a film doesn’t need any fans to spawn a sequel. It’s not unusual for companies to decide that they’ve sunk too much money into a struggling project to simply let it die, so now we have the sequel to The Hulk called The Incredible Hulk – glad they didn’t call it The Hulk 2. The new film picks up the thread of The Hulk’s story with a whole new cast and a new director in Louis Leterrier, the Frenchman who helmed the two Transporter movies. Leterrier is nowhere near Lee as a craftsman, but he’s much more comfortable with the demands of lowbrow genre filmmaking. That’s a big reason why his movie, which is no masterpiece, nevertheless does a much better job of satisfying your basic blockbuster-movie needs. The story begins some time after the Hulk’s initial destructive rampage and the subsequent disappearance of Dr. Bruce Banner (Edward Norton). Bruce is now hiding out in a slum in Rio de Janeiro, working at a soda-bottling plant, taking jiu-jitsu lessons to control his anger, and corresponding with a fellow cellular biologist known only as “Mr. Blue” in the hopes of finding a cure for his condition. 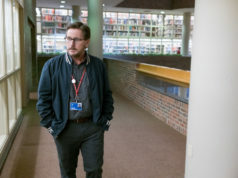 Since we don’t want the whole movie to be about Bruce doing breathing exercises and dealing with workplace politics at the plant, the sinister Gen. Ross (William Hurt) – who was funding Bruce’s previous medical research and also happens to be the father of Bruce’s beloved Betty Ross (Liv Tyler) – twigs to Bruce’s location and sends a tactical team after him. Soon Bruce is back in the States and turning green again. 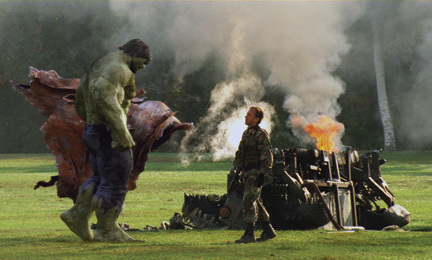 The DELETE by Zak Penn (the co-writer of the last two X-Men films has an uncredited assist from Norton) is built around three big scenes of the Hulk tearing up stuff. Leterrier’s loud and busy treatment of them yields workmanlike results rather than awe-inspiring ones. The computer-generated Hulk still doesn’t quite convince us of its reality. The rest of the movie is filled out with wink-wink cameos and romantic scenes between Norton and Tyler that simply die on arrival. Their interludes are at least brief enough not to impede the pace of this 114-minute film. Nor is there much comic relief to get in the way, except for an amusing bit early on when Bruce tries to deliver his “You wouldn’t like me when I’m angry” catchphrase to a bunch of Brazilian goons but winds up mangling his Portuguese. There is the germ of a really good idea in the DELETE. Gen. Ross turns out to have been duping Bruce into doing research to help create a race of supersoldiers. A Russian-British merc (Tim Roth) gets wind of the project and volunteers to become the first such killing machine, receiving injections of serum made of Bruce’s blood that reverse years’ worth of combat-sustained injuries and eventually turn him into the Hulk’s evil doppelganger, Abomination. 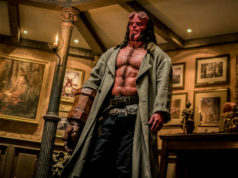 This storyline’s parallels with steroids and performance-enhancing drugs are compelling – Roth’s eyes light up hungrily at the prospect of becoming invulnerable and Mr. Blue (a scene-chewing Tim Blake Nelson when he finally shows up) watching Bruce change into the Hulk and using words like “beautiful” and “godlike” to describe it. In a mostly junkball piece of entertainment, these unsettling notes are pretty cool. It’s a shame the filmmakers didn’t follow up on this. The scene at the very end contains a cameo that ties the movie to Iron Man, and that’s when the real reason for reviving the Hulk becomes clear. Marvel and Universal are trying to start a superfranchise: Both designed to spawn sequels of their own, The Incredible Hulk and Iron Man have also laid groundwork for the movie version of The Avengers slated for 2011, which will incorporate characters from all these different superhero sagas. (There’s also supposed to be a Captain America movie that same year that’ll feed into The Avengers.) This undertaking is ambitious on an unprecedented scale, and who’s to say it can’t work? If the rest of the movies are no worse than The Incredible Hulk, the superfranchise will have a chance. But at least a few of the movies will have to be much better. Starring Edward Norton and Liv Tyler. Directed by Louis Leterrier. Written by Zak Penn. Rated PG-13.